Little Joe is a Tower Hobbies P-51D Mustang. The plane is stock except for the prop, which is an APC 9×7.5 a Master Air Screw 10×6. This prop gives more thrust than the APC 9×7.5 I was previously running, and actually draws less amps (20 vs 22). This is a great little plane. It flies fast or slow surprisingly well. I was expecting the plane to be more of a chore to handle than it is. It floats amazingly well for a low-wing warbird, although it doesn’t like sharp turns at low speed, which will tip stall you every time. Read more about it on this thread on RC Groups. I had to re-glue the motor mount together once (or twice) after a bad hand launch (or two), but the plane still flies great, right side up or upside down. The plane uses a Spektrum AR6100 receiver. I fly it with 1800, 2100 and 2200 mAh lipo batteries. The photo below shows the location of my battery, conveniently close to the Center of Gravity. This entry was posted in My Planes, R/C Planes. Bookmark the permalink. I own one of these and I LOVE it. 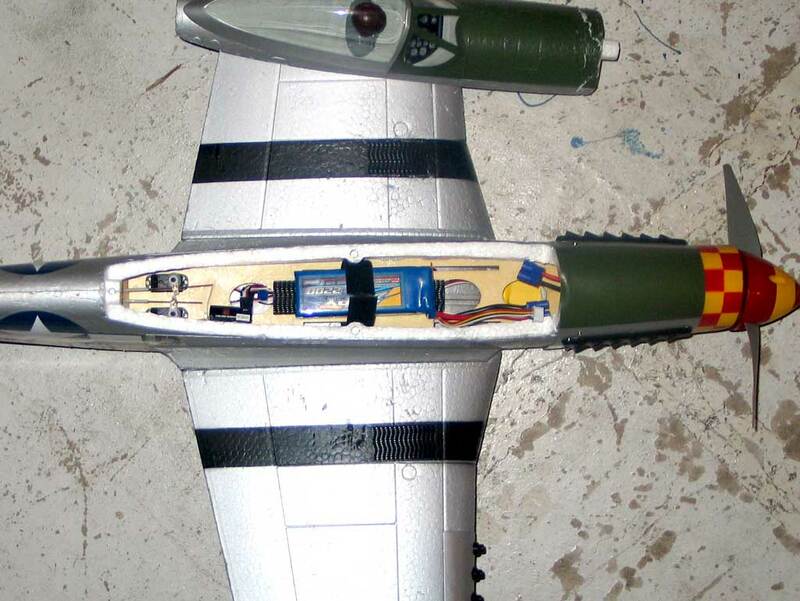 I never leave anything alone…so my p-51 now looks more like a P-fifty-what?? But I flew it plenty in it’s out of the box form. I would never tell anyone that ANY plane is a ‘good first plane’ if they have not taken advantage of even the simplest of flight sims that are available. My feeling is that if you spend many more times on a plane(even this one)than a flight sim to REALLY develop flight skills…then NO plane is going to be a good first plane. it will be a ‘good first toss or fixer upper. and that is NO way to grow an RC love/habit. I, on the other hand. took the sim route into RC. So after many crashes and countless ‘ah haaaaa! moments…I found myself ‘flying naturally’ on my cheapo sim(a whole $20! )and THEN took my first plane(Radian)out to the real world…which has enough similarities AND differences with/over sim flight than when I crashed(and I did)I knew WHY and getting the real world polish to my skills did not take that long. I depart inot a bit of sim talk so that anyone who may think that the p-51 is a good starter plane think twice. It could be…BUT…unless the pilot has the skills to discover and cooperate well with what this little wonder has to offer…they will be disappointed FAST. Because this is a fast little plane and the new pilot can(as is true of any plane in its basic style and setup)get into trouble FAST. I really try to impress on ‘wannabe’ RC pilots to get to a place where they can get what a plane has to offer instead of suffer the consequences of NOT being that attuned BEFORE they pick up a plane. I’m not afraid to pick up and fly anything . On my first day in the real skies I flew both Stryker and Radian. Two VERY different planes and skill demands. I loved it. and have too many hours to count it seems on those and a few others since. 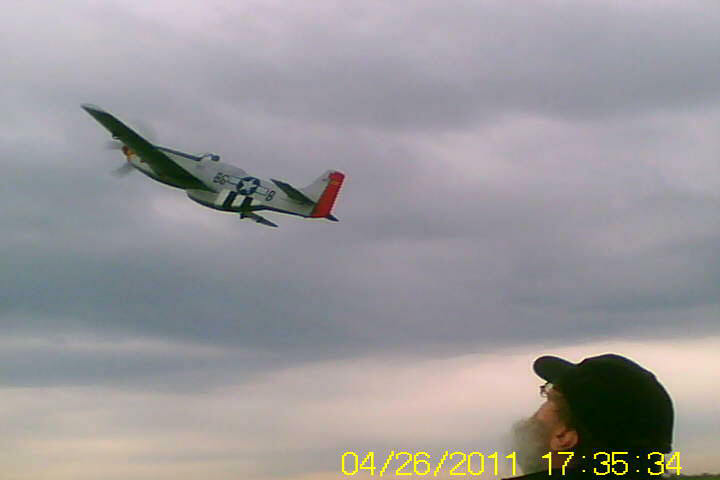 THEN a flying buddy of mine(with more planes than he has time to fly)GAVE me his NIB TH P-51! Yes….GAVE. I opened it up and was quite intrigued to fly it. I had not flown a warbird before and expected ‘something different’ and different is what I got. WOW…it flew off on hand launch SO nice and smooth the very first toss. A few clicks to trim but nothing major. And I was flying it on a little 1300 mah 3s. So it was even more agile than a heavier battery will allow it. Since…I have flown it on everything from the 1300(no to low wind)to a 2200 to even a big old 2650 and with every battery it still flies great! Maneuvres are slightly dampened at the heavier bat end of course but not too much. I am surprised what this little plane will handle bat range wise! I mentioned ‘hand launch’ as that is all I can do at the site near me. No problems with. Belly landings can(and did)break the solid prop due to the contour of the fuse bottom, which forces the nose down/prop too low to the ground. after 3 or 4 flights the rop snapped. I mounted an 11×6 graupner flding prop to alleviate that ever being a problem again. I know…11 x 6 is too big but it is what I had and the plane flies GREAT on it! I have some 9 X 6 and 10 x6 on order. Bats get a little warm with this prop but i just fly shorter till the others arrive. I even tried the stock radian blades that I had set aside when I made the upgrade to graupners for that plane…p-51 flies good still but nothing beats a high quality prop for performance. Motor is stock. I always change to a better prop before changing a motor out. Proves a good choice on the p-51 also. The P-51 has become my go to plane! it is SO maneuverable and intuitively so(for pilots with skill). It is the FIRST plane I have had that did not visit a tree or two in the tree infested park we have to fly in. If I get too close I can tell it what to do and it DOES it…RIGHT NOW! So there HAVE been some very close tree skims! Kind of exciting to do a ‘touch and go’ with a tree! This plane feels like more of a natural extension than any of my Strykers and I love the Stryker platform. The TH p-51 delivers at low speeds(helped by a lighter battery)and at high speeds. This plane has brought out the ‘combat’ flier in me more than ever…and it is a blast to see it so well respond to whatever you tell it to do. I flew it in winds gusting from 10 to 20 mph(2200 and 2650 bats used so it would not be dangerously underweighted for it)yesterday. Dumb? Maybe…but I want to know what my planes can do and it was a BLAST seeing this little plane hang in the air up high and then shoot down wind lile a falcon on crack. VERY exciting and enjoyable flying and I will do it again. Lots of turbulence on landing and a perfectly flat approach got turned into a wingtip snapping roll at 2 feet above the ground, by a rogue gust, That is what Gorrilla Glue is for. Fixed easy and perfect. So…If you have the skills to respect this inexpensive and satisfying little plane…you will love what it gives back. Below are the tweaks I did to it. I will fly this plane till it is unflyable and then I will happily get another! I upgraded the prop to a graupner folding for reasons explained. I fly with a light battery for light conditions and heavy for heavier…this plane has a WIDE conditions envelope with right battery/weight. I had to cut out a slot in the inner cockpit to accomodate the extra length of the 2650. no issues. I also turned the pilot around backwards…seems to have added some performance! 😀 I also inserted two 4″ bamboo terriaki sticks(make great foamie stiffeners!! )in each wingtip as the factory rod ends about 3″ short of the wingtip. I also foumd the factroy motor mount to be unforgiving(as the author of this blog has as well)and replaced it with a metal motor mount made from a tie plate from Home Depot. Works GREAT and is forgiving/bendable). I have also used empty Advil bottles as motor mounts(on other planes)and they work excellent for that. I added two span wise stiffeners to the wing joints and the wing is stiffer than new. I have had to replace one of the stock plastic servos as pooped out like PS’s are so good at doing. I am NOT a fan of plastic servos. The stock servos are loud and seemingly not very good quality. I keep a stack of TPro MG90 servos that I put in whatever I fly. They have never let me down. The RX is an Orange and no faults with. I don’t fly this plane as far out as I would my 2 M’s but I have had it pretty far out a few times. This is a plane that is more made for keeping close(relatively)and flying the heck out of! I also wrapped the entire plane in aluminum tape. stiffened it up for not much weight and it really lights up in the sun! So…the point of all this is that whether out of the box or with all the (some ‘crazy’)mods I have done to it…the P-51 flies SO excellent! If you are a good flier(or cannot help but mod this plane) it just keeps delivering!! Thanks for giveing me time and space to give my experience with the TH P-51. I have some vids(post mod and pre mod) of it on youtube (search: ‘shoegooguru’). I’d be flying my P-51 again today…but it is too gusty and it is raining on and off. But it is ALWAYS ready! Hey, Lee! Thanks for the comment. This is a sweet plane and an amazing value at around $110. Mine is still stock except for a Master Airscrew 10×6 prop which looks great and flies great and pulls very low amps. That, and some clear packing take on the bottom of the fuse and the LE of the wings to help keep the foam together when I belly land in my really rough flying field. You mentioned you’re using the Master Airscrew 10×6. Is this the one? (Master Airscrew 10×6 G/F G3 Nylon Propeller) Did you have to balance it on the Mustang? That sounds like the one, yes. The prop I got was balanced and good to go.